So I sitting in my chair tonight watching "An Evening With Kevin Smith 2 - Evening Harder", when I looked at Cnn.com and I was horrified to read the headline "7 dead as Mississippi River bridge falls amid rush hour in Minneapolis". Now anyone who knows me knows there are two things that I am. First off, a I am a News Whore. I check many news sites many times a day. Second thing is that I freaking love roads, bridges, freeways, and really anything based on and/or around transportation. 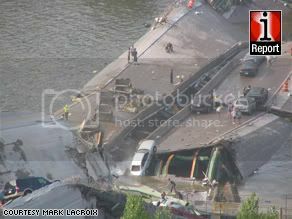 So, a interstate bridge collapse to me is really really freaking fascinating. Especially one for a bridge that has withstood the test of time like this bridge has. The specs for the bridge can be found here. Now after looking over the specs for the bridge, there was a paragraph from that webpage that really struck me. A University of Minnesota Civil Engineer in a report to MN-DOT recently noted that this bridge is considered to be a non-redundant structure. That is, if any one member fails, the entire bridge can collapse. A key factor is that there are only four pylons holding up the arch. Any damage to any one pylon would be catastrophic. Now no one knows what caused this bridge to fail, and my guess is that it will be a little bit of time before we do know. Also when this first happened, terrorism was brought up as a possibility since it happened in the middle of rush hour. This was very quickly shut down as an idea by many different sources including Homeland Security, FBI, The State of Minnesota, and the City of Minneapolis (and many more that I have forgotten). I really do not know if it was terrorism or not, but I must say that I would not be really surprised if it was and I would not be surprised if it was not. Even if it was terrorism and this was known to the government, the first thing they would do is deny it to keep fear from spreading. Now, I am not trying to spread fear and panic. Really, when I first heard that this had happened, terrorism was not the first thing to hit my mind, and really only crossed it after it was mentioned in some live web coverage I was watching. What ever the cause of this failure, we must not look over the fact that so far (as of my writing this) 7 people have died and many more have been injured. This bridge was packed with bumper to bumper traffic during rush hour when it failed. My guess is that come morning, we will find out that many more have lost their life in this tragic event. My heart, thoughts, and prayers go out to all the people and family’s affected by this event.